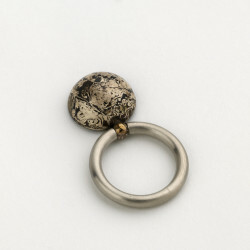 Stainless steel ring with a ball hanging from a socket joint. Copperfoil crumpled and corn pressed to form sphere, then flooded with solder, then filed to produce smooth surface. Ring part from solid stainless steelrod, ends hollowed out to form socket. Ball with stem turned and soldered into sphere. Both parts hold under tension. Sphere, Elisabeth Holder, 1987, Crafts Council Collection: J191. Photo: Todd-White Art Photography.